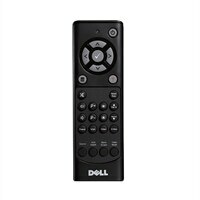 Control your Dell projector from anywhere in the room using the slim and handy IR remote control from Dell. The remote helps put control of the projector at your fingertips, and lets you stay in charge of your presentation without having to use the projector's menu buttons. Remote control's button options include Keystone adjustment, blank screen, and volume up/down.